THERE is a stark difference between record and perception. Your record is what you stand on; what you have done or delivered; what is there for everyone to see and judge. On the other hand, there is perception. It is what is perceived, or imagined, or suspected to be; it is claimed that something is suspected to have happened, but has not been proven. It is not there. It is alleged, not factual. That essentially is the reason why we think it would be difficult to topple the government of Prime Minister Peter O’Neill. It is also the reason why we believe the Opposition’s proposed motion of no confidence in the prime minister is not only premature but ill-conceived. After three years in office, the O’Neill government’s record of achievement is outstanding. Its tuition fee free policy in education has seen enrolment numbers rise to 92 per cent. This policy has enabled more than 1.2 million children to be in school now. New transport, communication, water and power infrastructure is changing Port Moresby, Lae and other towns and rural districts. Better roads in Port Moresby and Lae are making both cities functional again. They are getting new air and sea ports. In time they will be vibrant commercial and industrial cities in the Asia-Pacific region. Mt Hagen has a new airport terminal to cater for increased traffic; Kimbe, Kavieng, Tokua, and Alotau are also getting upgrades. The free healthcare policy has simply made health facilities more accessible to more people. Plans for new hospitals in at least five provinces have already been approved. A coastal shipping service has recently been launched in Morobe, to replace the collapsed Lutheran Shipping, to continue serving more than two million people in the Momase region as well as the East and West New Britain provinces who depend on maritime transport daily. Against this record are a set of reasons – or allegations – that the Opposition has put forward that they say justifies a change of government. The Opposition has used both the mainstream and social media to make a case. Deputy Opposition leader Sam Basil’s scathing attack on The National in the social media on Monday, particularly his claims that our journalists have been “taking overseas trips, drinking and partying with government ministers” and “wining and dining with the Prime Minister and his corrupt mates at their favourite drinking turf” is ludicrous and unbecoming of a national leader. We have given both Government and Opposition fair opportunities to be heard, even when Namah went into hibernation. Nonetheless, MPs in government appear uninterested and remain intact behind the prime minister following the Opposition’s announcement last Sunday of the proposed motion of no confidence in O’Neill. It is true the prime minister has a number of issues he has to deal with, including a warrant of arrest that is before the court, and a matter pending before the Ombudsman Commission. But MPs seem confident these matters will run their course in the processes allowed by law. It is true the economy is facing some stress as a result of a sharp decline in revenue but the detailed media statement by Treasurer Patrick Pruaitch gives the people confidence the Government is making the necessary adjustment to safeguard PNG’s economic gains and maintain growth momentum. 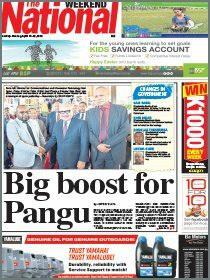 Drastic cuts in expenditure will lead to infrastructure development slowdown, resulting in job losses for Papua New Guineans and no doubt everyone, including the Opposition, do not want that. The next session of Parliament is two weeks away and if indeed they have the numbers as claimed, the Opposition must produce the MPs in their camp and name the person they will propose as prime minister. The public must be allowed to assess this alternate prime minister and his policies, and judge whether this person will do more than what O’Neill has done in three years. Otherwise, the record weighs in favour of O’Neill completing his term in office before the next general election in 2017. It can be said that O’Neill was fated to become prime minister in 2011 and continued to hold office after being triumphant in the 2012 general election. Is Don Polye or Belden Namah fated to join this exclusive club? Or Sam Basil for that matter? We do not think so as the odds are heavily stacked against them. 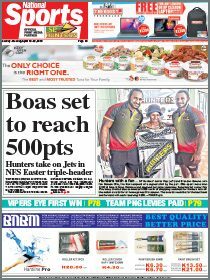 The performances of Namah and Polye as Opposition leaders leave a lot to be desired. Moreover, Namah’s term saw an exodus of MPs to the government benches that left the Opposition in complete tatters. If the Opposition is indeed serious about ousting O’Neill, they will have to propose an alternate candidate who is supposedly “prime minister material”. There are three former prime ministers and current governors who could put their hands up for the job, although we understand two of them are still aligned to the ruling coalition. That leaves the wily old man of PNG politics, Sir Michael Somare, to bid for his last hurrah. Still, it will be against all odds should the country’s founding father reclaim his throne.